During these recent no school days due to inclement weather, it was hard to keep our own kids occupied, especially when it was bitterly cold. Our son even commented, “Are we getting too much screen time?” We assured him that once the weather warmed up, they would be able to get back outside and play. The advent of the Internet along with screens becoming mobile – tablets, smartphones, laptops – has brought both advantages and challenges to our lives. On the plus side, we can communicate with anyone in the world at any time through video and text in addition to a phone call. Being able to see and talk with a family member or friend many miles away through Facetime or Skype has brought our world closer together. However, these benefits are soon taken for granted, and then we start thinking about all of the disadvantages of a constant connection. For example, if our smartphones are always on, when can we truly take a break? In the case of our children, all of the digital media options they now have in the form of online gaming, social media, and streaming shows can occupy a young person’s life like never before. In the midst of this challenge, one question that comes up frequently is: how much screen time is too much for kids? The American Academy of Pediatrics used to recommend no more than two hours a day. Recently they have replaced this rule with more differentiated guidelines for families (which you can find here: www.aap.org). For example, young children should have less screen time than older kids and the content they watch should be high quality and educational. I also believe It is not just about how much time. What kids are doing with screens? How are they engaged with what’s online? Why do they choose to watch and interact with a game, app or program? Next are my reflections on each question. What are kids experiencing on a screen? Kids’ minds are at different developmental stages based on age and readiness. If you have concerns about what they are seeing, they are likely valid. Follow the ratings and remind yourself that you are the parent; you get to make final decisions as long as they live under your roof. If there isn’t a rating, engage in the content with them and make a decision, together if possible. How are kids engaged on a screen? There’s a difference between watching a continuous stream of unfiltered YouTube videos and learning how to speak another language with Duolingo. We as parents can help our kids self-monitor what they consume by discussing these differences and building an understanding of the limitations and possibilities of time spent on a screen. Why are kids choosing to be on a screen? In my own personal experience, too often I will reach for my smartphone out of habit or because I am bored. My guess is you have had this awareness too. Talking about this with our kids can set up a productive conversation about our habits and what we are choosing to give up when we go online. It’s not about a choice being bad or good but about understanding that we have choices. A more nuanced approach to raising our kids in a world of screens is more complex than a hard-and-fast rule like “No more than two hours a day.” Yet there is also opportunity in engaging with our kids in conversation about this new connected world. We can learn together what it means to live a better life both online and offline. During a regional principal’s meeting today, our conversation steered toward the integration of technology within instruction. Smartphones were a frequent topic, especially from the secondary school leaders. Distractions and inappropriate use seemed to be the common reason for some of the administrators’ disdain for students’ mobile devices. I empathized, as a former junior high school assistant principal. My administrative career began in 2011 which is around the time that iPhones started to come into prominence. From the beginning of my secondary tenure until my shift to an elementary principal role four years later, smartphones grew in frequency and in use in school. I always had a few of them on my desk or in a drawer. Many of them were more advanced than my district-issued smartphone. Today, every educator seems to have a different perspective on the use of technology during classroom instruction. Each one of us seems to have a nuanced point of view about digital tool integration. This perspective can change based on the content, the task, the students’ developmental level, and the technology itself. For example, one administrator today stated that she does not know the best approach for managing smartphones in schools, yet she did believe that high school students needed more than a Chromebook for engaging in creative, original work. We will not get to a point of consensus in the near future regarding “best practices” when it comes to technology in education. So how do we address these types of challenges with more intent? One approach when preparing a lesson or unit of study for our students is to consider the opportunity costs of the inclusion or exclusion of technology within our instruction. The concept of opportunity costs comes from the financial world. Whether you spend money on something or you decide not to, there is a cost. Say you are saving up for a family vacation. Every purchase you make from the moment you create this goal to the moment you go on vacation has a cost. Should we go out to eat? Yes means you can enjoy a meal out with family, but you are not saving that money toward the vacation. No means you are saving that money, and the cost is not enjoying a night out at a restaurant. What is the goal of the lesson/unit of study? These are the essential learning outcomes, usually aligned with a standard, a competency, or a larger understanding, i.e. “conflict” within a study of U.S. history. Really not a lot of opportunities to incorporate technology into the lesson (unless the instruction is focused on learning how to use the technology itself). How will I know that my students have learned? We are looking for ways to evaluate understanding with the best tools available. Deciding how to assess student learning might be a better opportunity to incorporate technology. For example, if we want to know if students truly understand the concept of conflict through the lens of U.S. history, a multiple choice test or a written essay may not cut it. What if we designed a performance task such as creating a podcast in which two students debated in a respectful manner over a decision made in our country’s past? We could hear whether or not students used the strategies for a persuasive argument, both the language they use and in the way they used that language. They could also self-assess their work. the integration of 21st-century skills into instruction. more time spent working on this project, which can impact future instructional plans. So should we integrate podcasting into our performance task? Here’s the thing: there’s no clear answer. We cannot say “four to three” in favor of the inclusion of technology. Every school and every teacher are unique. Maybe one teacher doesn’t feel comfortable introducing podcasting as an assessment tool by herself, but she has a library media specialist who is more savvy about these tools and happy to co-teach this part of the unit. Educators have to use their professional judgment when it comes to classroom technology integration. This requires both an open and a discerning mind, a mix of strong pedagogical knowledge along with enough social imagination to understand that teaching and learning are in a constant process of change. If you try out this process, of analyzing the opportunity cost of technology implementation within your instruction, let me know how it goes. 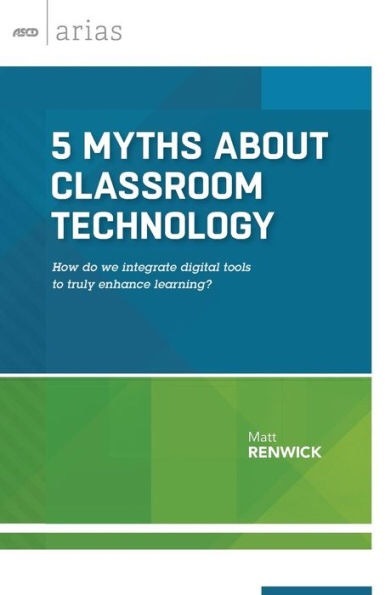 In my book 5 Myths About Classroom Technology, I tackle five misconceptions regarding the integration of digital tools in schools. You can purchase my book through ASCD here. What technology can do becomes what we need it to do. I had to reread this quote several times to gain the full meaning. In my mind, what DeLillo and David Streitfeld (the featured reporter) are conveying is that technology tends to amplify or even bend our beliefs and point of view through the lens of the tech itself. It can be like a prism, with light refracted in different directions once it shines through. We feel like we don’t have a choice in what we choose to view until we take a step back and re-evaluate. Streitfeld was also asked what tech he does use. “I still marvel at email.” I laughed at first, then reconsidered my reaction. Email, when not a default to-do list for work, can be a primary and effective form of communication for long distance connections. Regarding the friend/colleague who sent the New York Times article, we exchange email messages on a regular basis. We’ve only met in person maybe half a dozen times. It’s like letter writing without the delay or all of the stamps and envelopes. These informal email exchanges; they’re nice. No expectation to read any resources shared (although I always do). Simple food for thought, curated and delivered within a low-tech format. With that idea in mind, I am using a newsletter tool called Substack. People can subscribe for free. The purpose is to serve our need to share great ideas and resources within a condensed and accessible platform. My plan: to publish once a week a list of links to blog posts written by myself and others, relevant articles I enjoyed, helpful resources, books and articles I have been reading/writing, and any events to be aware of. I will also promote some of my work along with colleagues’ efforts from time to time (you’ve been warned). Most items will relate to the topics of literacy, school leadership, and technology as the newsletter will primarily support the visibility of my blog. To subscribe, follow this link. No newsletters up yet; I plan to start a week from today. If you have suggestions for this informal project, let me know. Highlighted in a poster session Sunday evening, a retired teacher decided to stay involved in education by posting a weekly writing prompt online. This free prompt might be a phrase, a sentence, or even an image. Students then write a story based on that prompt in only 100 words. This teacher organizes and posts students’ shared stories via Kidblog and Edublogs in one space for anyone to comment on their writing. This native app for iOS was initially just a way to add closed captioning to video. During a session about Swift Playground (an Apple coding application), the presenters – all secondary teachers – shared that they have their students post their coding projects into Clips. The features available as of its most recent update are impressive and allow for creative performance tasks. You can record audio over images and videos, annotate images from your Photos library, lay a soundtrack over your multimedia, and add stickers to the content you record. Think iMovie only easier. The author of The Martian and Artemis was interviewed by a local literacy education professor during the Tuesday morning keynote. Weir was authentic and humorous as he recounted his journey from a college drop out to software engineer to best-selling science fiction writer. As a young kid, Weir wrote Beverly Cleary fan fiction (yes, you read that right). In high school, he worked for a local science lab cleaning out test tubes. One of the administrators there asked him to learn how to program a computer to keep track of their data. All he was provided was a manual. Weir’s appreciation for problem-solving found a home in software engineering at that point. The digital boat show that is ISTE (to quote an anonymous colleague) was quite an experience. I am glad I went to the edtech convention despite my previous reservations. Still, the mere size of the event was often overwhelming. I felt obligated to get in line a half hour early for a session I had already registered for out of concern that I would not be able to get into due to popular demand. And I am not going to even address the expo itself, a place one could easily spend a day meeting technology providers and companies. As I thought about the three takeaways from ISTE, one common thread I discovered was that what I learned was not what I had expected going in. Before I explain, let me provide an analogy. My wife and I recently stayed at a spa for our 15th anniversary. (It is actually our 16th anniversary, but who’s counting.) One reason we like this location is their firm rule on no electronics on the grounds. No smartphones, tablets, laptops, even e-readers. The first time we stayed there, I fretted about not having access to Twitter, email, or my digital newspaper subscriptions. After our stay, I appreciated the opportunity to be offline. This time, I looked forward to our technology sabbatical. During our stay, I was waiting downstairs in the lobby to ask a basic question from the staff. One of the spa employees came up to me and asked, “Are you here for the guided hike?” At first, I said “no”. My next thought was that my wife and I would love a guided hike around the grounds. I told the staff member to hold tight while I went upstairs to grab my wife (it would have been nice to have a smartphone at that point). Anyway, an uneventful visit to the lobby led to a fun and educational hike with other guests as we learned about the local flora and fauna. So what does this have to do with ISTE, the conference for technology in education? The fact is, I had come with specific expectations. This was a big, national conference. Lines trailed along the hallways, waiting for sessions that wouldn’t open up for twenty minutes. Every workshop seemed to promise new ideas and possibilities. The time, expenses, and stress of attending ISTE would, in my mind, be worth the effort. By keeping an open mind about the limits of any learning experience, I was able to capture the diamonds in the rough. From the expo to the keynotes and sessions, there was much to capture our attention. Yet the seeds of possibility presented themselves when I looked for any idea that might spark innovation in my school vs. a specific tool or task. When I discovered the 100-word stories concept, I was simply browsing poster sessions. When I learned about the improvements to Clips, it was only a side note for the focus of the session. When I listened to Andy Weir’s keynote, I was pleasantly surprised to hear about his writing process instead of all the technical details of his research. In an educational world that demands specific outcomes of learning, the most refreshing part about ISTE was the gathering of so many people and ideas in one place. It’s not possible to experience the whole thing. I’m not even sure I will go back anytime soon. Yet the concept of bringing many passionate educators together with the sole purpose of sharing potentially better practices through the lens of technology excites me about the future of teaching and learning. By expecting the unexpected, or in other words, by holding my preconceived notions at bay, I was able to appreciate ideas when they presented themselves. This approach seems like an appropriate mindset for any learning experience. Three Ways Digital Portfolios Shift Your Assessment Focus (Teaching Channel, April 2018). I stayed at a cabin this weekend with my family for a relative’s college graduation, a quiet place along the bluffs of the Mississippi River. There was no wireless available. Cellular reception was spotty at best. While my younger family members fled in the evening for a more connected location, I was happy as a clam with my current status. I’ve come to regard the lack of access to the Internet as a gift to my efforts as a writer. Getting any of the previously mentioned pieces completed has enough barriers to begin with; adding a wireless connection compounds these challenges. Allowing my mind the space to read, to reflect, and to do nothing other than to just be is a welcomed respite. The time I gave to myself has proven fruitful: I drafted the initial post for an upcoming collaborative book study on my blog. Writing today is almost a paradox: we need to carve out the time and space away from the Internet to craft prose that will be well-received with an audience largely online. This is a unique issue that I enjoy exploring and will continue to revisit in the future.